Hanwei finally released their Crecy singlehander. Unlike the prototype, it doesn't have a rounded mid rib, but rather nice, hollowground diamond section. I like it. I think the hilt is really ugly, but it looks like a perfect blade for customisation, as there are very few single-handed diamond section blades available on decent price swords to use. SHOW me the hilt, under the grip core. It could be anything from a rat tail to 8mm thick. It has an SM instead of an SH prefix. $500.00 seems a little steep, but other vendors will probably sell it for less. There are also two blunts released along with it under the name of the Tourney Line - http://casiberia.com/prod_list.aspx?q=kingston I wonder who or what is Kingston Arms? I agree that the pommel is kind of ugly. The Crecy War Sword (and the two tourney blunts) is made for us by the Dragon King forge (see here for info). Kingston Arms is a series of European swords; sharps, blunts for reenactment & stage, sparring swords, etc. developed by us at CAS to our specifications. There are many more swords in the works including a collaboration with a well known US sword maker that should all be available early Summer. Dean, We have tested and torn down the series of prototypes that we went through to get here. But they all look slightly different from the end result. So once we receive the production swords we'll work on some videos and photos to show them off a good bit more. There are many more swords in the works including a collaboration with a well known US sword maker that should all be available early Summer. While we have some more things in the works with Tinker, he is not the maker who will be designing this new line. $500 is the MSRP, so it will likely be retailed for less-- I would expect ~250-300ish. This is not terribly out of line with their other swords such as the 1881 Shashka ($346 versus $525 MSRP) and Cawood ($289 vs. 440). A little more pricey than the Hanwei Tinker swords, but it appears that it's a slightly more 'finished', less utilitarian line. Thanks Blake - SHOWING a typical tang would be a GREAT step forward - virtually NO ONE does this. Picking what you believe to be a typical production unit, and giving an honest tang photo, would put this model into my "must buy" list. I've torn down & rebuilt a LOT of swords, from various makers I won't name. Let's see, best way to say this..... many have been very attractive - with tangs, hidden in the woodwork, that would give any sane person nightmares . I am remiss in that I didn't note that the retail prices I quoted are from Kult of Athena, and could probably be considered the low end of the retail range for CAS pieces. Prices at other retailers may of course vary. 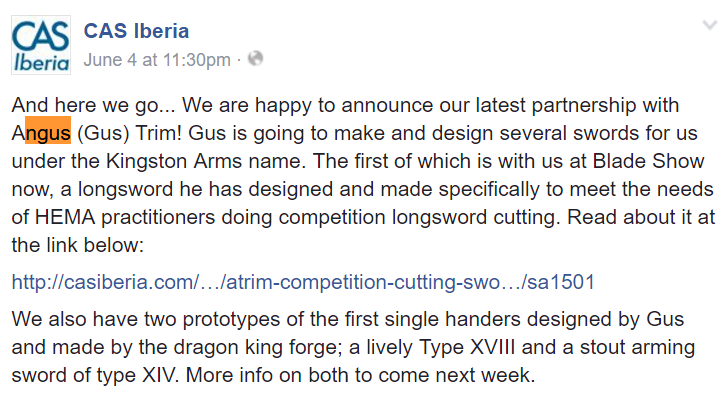 Now we know that that swordmaker is Gus Trim. I got a chance at Blade to handle the type xiv prototype from the afore mentioned collaboration. It's really sweet. On the light and slender end of the type, but that is not a bad thing at all. The proportions are pleasing. It feels lively and ready to move from the guard, and I expect it would be very nimble in motion. I am looking forward to when it goes into production. Indeed, as announced on their Facebook page. I thought more was to come from Tinker too on that department - but things have been rather quiet since this was announced. Same for the Crecy sword (and by the way CAS, there are half a dozen sword on the market bearing that name already, marketing did not flex its creative muscles too hard on this one... ) it's been talked about, then pretty much dropped off the radar - seems it did not reach retailers for quiet a while. Anyway, It is now listed on KOA, with the trademark close up pictures. It looks to be a very nice sword at this price point (400$ on KOA) - nice (pronounced) hollow ground blade, clean fittings, leather covered scabbard. Anyone care to write a review on these? 8.7mm at the base sounds very good. 3mm at the tip is also good for this type of sword.